The UCSC Bike Library is a bike lending program designed to increase bicycle ridership, safety, and awareness on the UC Santa Cruz campus and among students in the Santa Cruz community. Our mission is to make bikes accessible to students, faculty, and staff of UCSC to promote transportation sustainability and self-sufficiency. We aim to promote bicycling by providing quarter-long (9 week) bike loans along with a safety orientation, maintenance assistance, and general support. Recipients also receive a helmet, lock, and set of lights to borrow. We believe that financial limitations should not be a barrier and provide our services free of charge. While the program is free, recipients are expected to pay for lost or broken equipment. We hold recipients accountable by billing their student account. Recipients are selected based on their application due during the first week of each quarter. Applications include a 500-700 word explanation of why they need a bicycle, and each essay is assessed based on a guiding rubric. We hope to increase our fleet steadily each year, but we need funds to do so. If you are aware of any grant opportunities to help us purchase more bikes, please contact us! 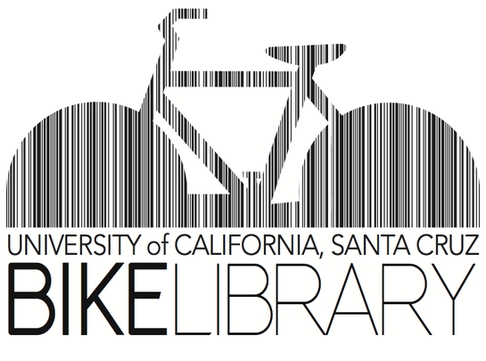 ​The Bike Library was founded by the Student Environmental Center's Transportation Campaign. It was created after the first year of "The Community and Culture of the Bicycle" class in the spring of 2008. The Bike Library began rolling the following fall and has since been providing UCSC students, staff, and faculty with free bicycles every quarter. It was originally a bike share program created, designed, and directed by students. After a few years the program grew too large for students to manage on their own, and the campus Transportation and Parking Services began sponsoring the program. Funding for the program came from the Campus Sustainability Council through a student fee designed to support student projects that promote campus sustainability. Now that the Bike Library is under the direction of UCSC's Transportation and Parking Services, they are our new funding source. Our mission is still to promote bike ridership and support a growing bike community by providing bikes to students, faculty, and staff who would otherwise not have them. If you are interested in getting involved, you can try joining the SEC Transportation Campaign or contacting us to see if there are any ways to get involved! Send us an email at bikelibr@ucsc.edu if you have questions. Or, check out our new training manual--chalk full of goals, procedures, safety checklists and more. Learn how we work, so that we can further benefit you.